These came about for two reasons. Many folks order filled sandbags from us to hold down tents & canopies at fairs, farmers' markets & festivals, but need an easy way to secure their canopies to the bags. These straps make it easy to tie a line or clip a carabiner to the bag. 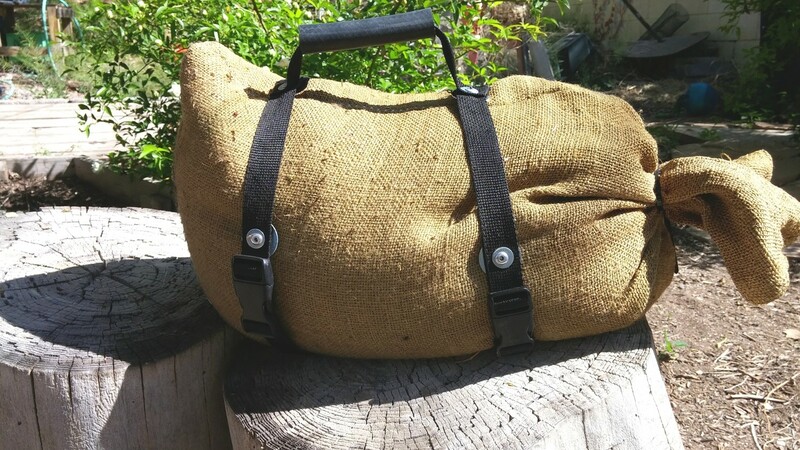 Other people (including geologists and prospectors collecting rock samples) have a need for an easier way to haul heavy, filled bags over rough terrain without tripping and without the bags tearing. These balance an awkward & heavy load and help make hauling much more manageable. Made of 1" nylon webbing, held together with steel rivets & washers, they have plastic quick-release buckles and a rubber (or PVC) comfort handle. They attach and detach in seconds. Straps, of course, are adjustable. Great for that dusty 60 lb. sack of concrete from the hardware store that you don't want to hug to your chest with two hands as you lug it out to the car. Handy for firewood and travel, too. Currently only available in black, but we can get webbing in a variety of colors. Ask if you're interested.